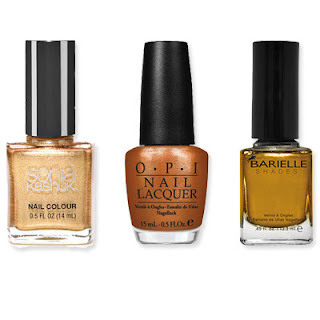 Giving your nails the Midas touch requires a bit of finesse. "Make sure to pick a gold that's not too yellow-y, which can look tacky. Choose a warmer tone instead," says Johnson. Sonia Kashuk in Reach for the Stars Gold, $4.99; target.com. OPI in Rising Star, $8; opi.com. Barielle in Aura Angora, $8; barielle.com.